We’ve had no issues with Verizon calls or data and excellent AT&T data coverage at Colorado River. Notes about the surrounding area: Columbus, TX is a small town with a population of ~3,500. It’s located along I-10 about 75 miles west of downtown Houston. It’s largely an agricultural area with many cattle ranches and farms. They have a reasonable sampling of local restaurants and several grocery stores, including a Walmart and HEB. There is some nightlife, but nothing exotic; mostly small beer bars. From what we tried, we enjoyed Latte Café, Los Cabos Mexican restaurant, Blake Street sports bar and Shaw’s Bend Social Club. -Latte is a local coffee shop that also serves sandwiches, soups and pastries. We really enjoy their beverages and panini sandwiches. They make most food from scratch and we liked their bread enough to buy some slices to go – the focaccia is AMAZING! -Los Cabos is your standard, American, Mexican restaurant, but it’s done well with a full bar and nice atmosphere. -Blake Street is local sports bar/restaurant with a full bar, decent specials and good food. Particular notes about this campground and/or sites: Colorado River is not a big campground, at 138 sites, but it has the footprint of a larger park. This allows for most sites to offer plenty of space between neighbors. 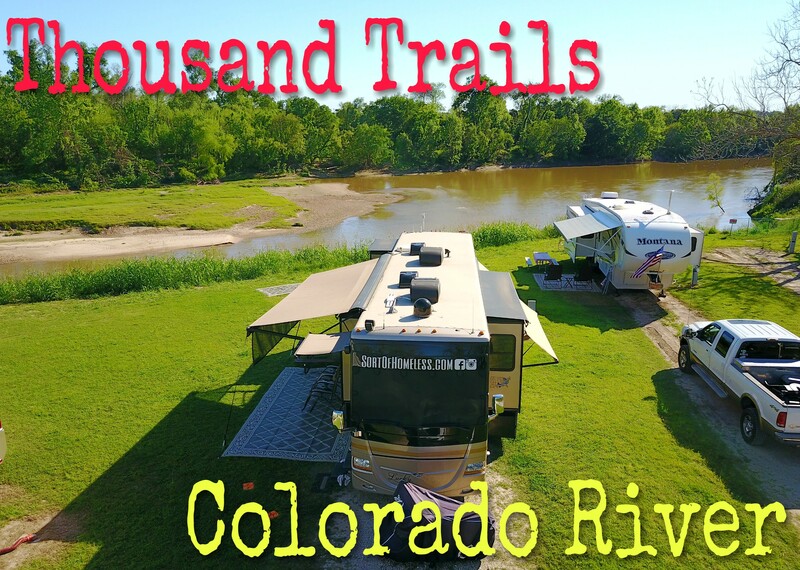 They offer six full-hookup, 50 amp sites that back directly up to the Colorado River. The remainder of the sites offer a good mix of 50 amp FHU, 30 amp FHU and a few water/electric sites. Most sites are grass and gravel, with a few pads of concrete left over from previous long-term campers. Like many other TT parks, some roads are in poor condition – especially those leading to the section near the river. The office will readily accept packages (and even call you when you receive one), but they do charge $2 per non-USPS package. There is also a $3/night charge for any site with 50 amp electric. Amenities: While we did not use any of them, this park has a nice offering of amenities. For sports, they have pickleball, basketball, volleyball, a LARGE 18-hole mini golf course, horseshoes, shuffleboard, and a pool and hot tub. They also have multiple playgrounds, several fishing ponds, a boat ramp into the Colorado River, hiking trails, and a dog run. There is also a propane fill station, dump station, laundry facility ($1.50 to wash, $1.50 to dry) and activity center. Our experience: We had heard from other non-retired, full-timer’s that Colorado River is nice. No one ever really raved about it, but never came up with any big negatives either. I think “solid” is a good word to describe this park. After spending a fast-paced Winter in Florida, and a four-day drive to get here, it’s been really nice to slow down a bit and get caught up on life (and sleep). We were fortunate to be able to select one of the six riverside sites, which are 50 amp full-hookup. That meant we could do as much onboard laundry as we wanted and also not worry about electricity management – which was not the case for much of the Winter. The staff has been over-the-top helpful and kind. We’ve also met some nice neighbors to socialize with, which is always a nice bonus. In addition to friendly people, the park is full of docile wildlife. We saw many deer, a bald eagle, armadillos, and heard owls and coyotes. Texas Spring weather deserves its own paragraph. We were in the Lone Star State last spring as well and quickly found ourselves in a hail storm that no one wants to be a part of. While that storm was the most damaging, it seemed to be one wave of storms after another – which ultimately led to flooding and the cancellation of our reservation to stay here last year. Beginning on our drive to Texas, we encountered a large front of severe storms in Louisiana that delayed our arrival by one day. We’ve had several other storms while we’ve been here and many windy days, but no harmful weather yet – knock on wood. I don’t think these two years have been “normal”, but I think it should be expected that you will likely encounter foul, and possibly destructive, weather in this region during the Springtime. SOH Score (1-10, 10 being the best campground imaginable): 7 – As mentioned before, there is no “wow factor” here, but it’s a really solid park. A great place to slow down, kick back, watch the river go by and catch some local, Texas culture. The only thing I can add about this park is watch out for the numerous ant mounds everywhere including all over the mini golf course. Of course I got bit first day out. Otherwise we liked this park and were there for Spring Break. We got to back up to the river. Was nice to be somewhat close to San Antonio and the coast for day trips. Fire ants are the worst… their bites seem to last forever! It was while we were at Colorado River that a neighbor shared a tip to spray fire ant bites with WD-40 to minimize the effect. I haven’t been bitten since, but I will be trying it next time. Thanks for leaving a comment, Beth! Hey neighbor! Sounds like you all have been through the ringer! I’m glad you came out OK! We’ll be headed west next month, so we’ll get our first exposure to west coast camping. Stay safe and enjoy! Your review is right on the money. I would like to add that T-mobile didn’t give us any trouble at all. As a person who likes to know things about the TT park were I will be next, I would also say that the park has limited internet per day in the front office. Also if you need RV parts, 25 miles from the park direction Houston in the town of Sealy, Cliff Jones RV tractor is close by. Thanks Claudette! That’s some really helpful information! We just stayed at this campground a couple weeks ago and pretty much agree with everything you said. We really liked how spacious and green it felt, and we were impressed by the friendliness of the employees. It was a great place to decompress for a couple days after some very busy visits to other places. But how on earth did you find that Shaw’s place? We never heard of it. Sounds like fun though! Haha! Shaw’s Bend is definitely a little off the radar, but you passed it every time you drove in or out of the campground. I usually use Yelp, Trip Advisor and Google Maps to scout the area. I think I first learned about it on one of those. Thanks for reading!